It’s a little difficult to arrange things for a hassle free baking exprerience in Bangalore, I think. I have been searching store after store for decent butter sheets and muffin trays and have returned dissapointed from many. Even the supposed largest lifestyle store’s sales people didn’t know whats a ramekin! Can you imagine that. Anyways now that I have collected many – thanks to Indro & his work trips- I thought lets get into the baking mood and make some muffins! yay. 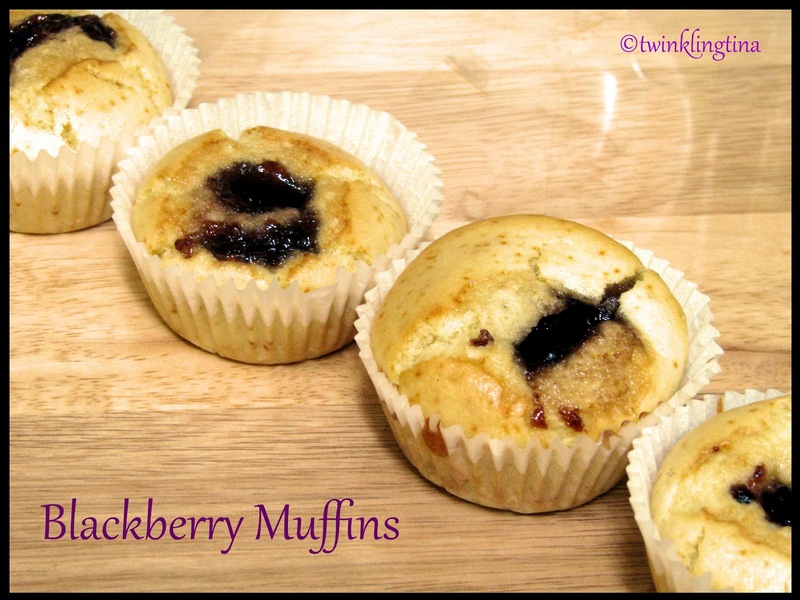 So here goes the easy little Blackberry Muffins… Don’t worry if you don’t get any fresh blackberry… I also didn’t… use a ready made blackberry preserve! Preheat your oven at 200 degrees. Its important to preheat your oven when you are baking. Slowly mix the wet ingredients . Mix milk and egg to the melted butter and combine it with the dry ingredients in a mixing bowl. Mix it till its a smooth paste. Put paper cups in a muffin tray. Now the easiest and the yummiest part. Put a dollop of Blackberry preserve in each cup and pop it into the oven. Bake it for 20-25 mins at 200C/400F. You can add fresh fruits, or any other preserves. Experiment n enjoy. wow I had no idea that you could make these at home.